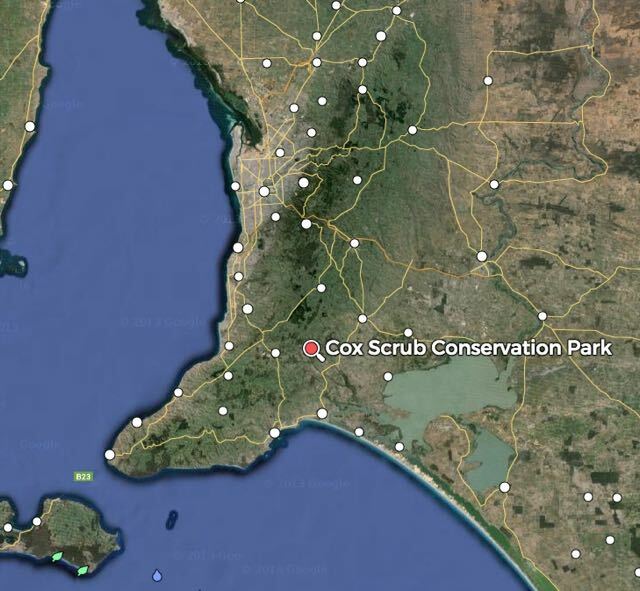 After leaving the Kyeema Conservation Park I headed for my second activation, the Cox Scrub Conservation Park, VKFF-824, which is located about 70 km south of Adelaide on the Fleurieu Peninsula. This was to be a unique WWFF park for me. Although I have activated the park a number of times previously as part of the VK5 Parks award. For more detailed information on the park, and thiose activations, please have a look at my previous posts….. I headed for the main carpark off the Bull Creek Road. This is on the eastern side of the park, and is the location from where I have previously activated the park. On my way to the park I had spoken with Col VK5HCF in the Penambol Conservation Park, VKFF-802 from my mobile. Col was keen to get me in the log for a park to park contact. And as I was pulling in to the park I gave Col another quick shout to let him know that I would be up on deck in about 10 minutes. So after setting up, I immediately went to 7.105 and there was Col VK5HCF calling CQ from Penambol. Col was my first contact (5/9 both ways) and a park to park contact for the VK5 Parks Award to boot. I then tuned down the band a little and heard Hugh VK5NHG calling CQ on 7.103 from SOTA peak, Eke Hill, VK5/ NE-069 near the Bendleby Ranges in the north of South Australia (5/9 both ways). I kept tuning down the band and my next contact was with Brett VK4FTWO, in the Burrum Coast National Park, VKFF-070 (5/6 both ways). I then went up to 7.095 and there worked Rob VK4FFAB who was also out and about, in the Venman Bushland National Park, VKFF-507. A mini pile up ensued after my contact with Rob, with callers from VK3, VK5, & VK7. This included QSO’s with Julie VK3FOWL & Joe VK3YSP operating portable at the Melbourne Museum, and Brandon VK4FABB who was activating VKFF-507 with Rob VK4FFAB. Following my QSO with Brandon, Ian VK1DI called in, operating portable from Percival Hill Nature Reserve, VKFF-859 in the ACT. For more information on Ian’s activation, check out Ian’s blog at…..
And a number of contacts later, Nick VK3ANL called in again, this time on the top of Mount Donna Buang, VK3/ VC-002 and within the Yarra Ranges National Park VKFF-556. I worked a total of 45 stations on 40m, before trying 20m. But the 20m band was very quiet. I had left my run there a little late. I only managed three contacts, however one of those was with Mike VK6MB who was activating Karijini National Park, VKFF-237, followed by John VK6NU. It is always good to get the VK6 guys in the log. I also had a visitor during this activation. It was Phil VK5GM, who I had worked from Kyeema. Phil lives nearby at Tooperang, so He decided to pop in and say hello and have a look at my portable set up. It was getting dark and was nearly 5.30 p.m. so it was time to pack up and head back home to Mount Barker. This was another successful activation for me, with a total of 48 contacts, and a new VKFF park to add to my Activator list. Just after lunch on Saturday 27th June, 2015, I headed out to activate two parks for the VK5 National and Conservation Parks Award and the World Wide Flora Fauna (WWFF) program: Kyeema and Cox Scrub. I had activated both parks previously as part of the VK5 Parks Award, but not for WWFF. Both parks have recently been added to the WWFF program, so these were going to be two WWFF unique parks for me. The first activation was the Kyeema Conservation Park, VKFF-826. 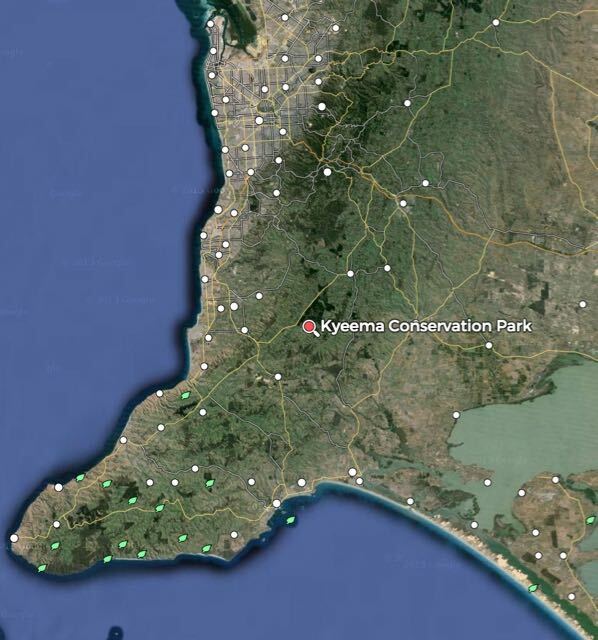 Kyeema Conservation Park is located about 60 km south of Adelaide, between Meadows and Willunga. For more information on the park and info on my three previous activations, please have a look at my previous posts….. The park is just a short 25 minute drive from home, through to Echunga and on to Meadows, and then along the Brookman Road towards Willunga. I turned into Woodgate Hill Road and followed the southern boundary of the park. I have previously activated the park from the main carpark area on Woodgate Hill Road. I was hoping to activate the park from a different location this time, so I looked at a few of the DEWNR gates along Woodgate Hill Road. However they were all locked and this involved scrambling over barbed wire fences. I travelled further east until I reached Blackfellows Creek Road, but could not find another suitable spot to access the park, so I decided to head to the normal spot. Just as I was pulling up into the park I spoke with Tony VK3VTH from my mobile. Tony was portable in Werribee Gorge State Park, VKFF-775 and had a lovely 5/9 signal coming into the mobile. I had a quick chat with Tony and told him I was about to set up. I didn’t want Tony disappearing to 20m. So I quickly set up my gear, the Yaesu FT-857d, and the 20m/40m linked dipole, supported on the 7 metre squid pole. Sadly, I had not checked the 44 amp hour power pack before leaving home, and it was down a little in charge. So for this activation I ran 20 watts. After turning on the radion I tuned to 7.095 and there was Tony VK3VTH calling CQ. So I gave Tony a shout and was very pleased to have Tony in my log as number one contact from VKFF-775 to VKFF-826. I then went down to 7.090 and called CQ and this immediately resulted in a mini pile up. First taker was Peter VK3ATC, followed by Mick VK3PMG, and then Gerard VK2IO. The pile up continued with numerous callers from VK2, VK3, VK4, and VK5, all with exceptional signals. And amongst all the callers I hear Rob’s voice, VK4FFAB who was portable in Venman Busland National Park, VKFF-507 (5/5 both ways). I was very pleased to get another VKFF park in the log. I also took a break from the pileup, and called for QRP stations and this resulted in calls from Greg VK5GJ running 4 watts (5/7 both ways), Ron VK3APC running 5 watts (5/7 sent and 5/8 received), and Steve VK2LAD running 3 watts (5/6 sent and 5/7 received). I went on to work a further 13 stations in VK1, VK3, and VK5, including David VK5PL (formerly VK5NQP) who has recently upgraded to the Advanced call. Congratulations David. And also Frank VK2BFC (formerly VK2HFS). Well done to you as well Frank. I was then called by my third VKFF park for this activation. This time it was Ian VK1DI who was portable in Percival Hill Nature Reserve, VKFF-859. This is one of the new 33 Canberra Nature Reserves added to the WWFF program. And it was a unique park for me to add to my Hunter list. A few QSO’s later I was called by Col VK5HCF who was portable in the Penambol Conservation Park, VKFF-802 in the South East of South Australia. Col was an exceptionally good 5/9 signal coming in to the Fleurieu Peninsula. I was also called by husband and wife team, Joe VK3YSP and Julie VK3FOWL, who were operating portable at the Melbourne Museum as part of Museums Weekend. Although Joe and Julie were running QRP 5 watts, they were an excellent 5/9 into Kyeema. My last contact on 40m was with Nick VK3ANL who was activating SOTA peak, Mount Little Joe, VK3/ VC-027. Nick was a good 5/7 signal. I left the frequency for Nick, and I headed off to 20m, hoping to get some DX in the log. I called CQ on 14.310 and this was immediately answered by Luciano, I5FLN in Italy. Not sure whether Luciano had seen me spotted on parksnpeaks, or was monitoring this frequency, but he was there straight after letting go of the mic, which was a really pleasant surprise. Another CQ call was answered by Max IK1GPG in Italy, and then Mike VK6MB who was portable in Karijini National Park, VKFF-257 (5/3 sent and 5/5 received). I had a good flow of callers on 20m from Slovenia, Germany, Italy, France, Belgium, Czech Republic, Corsica (a new one for me whilst portable), USA, VK1, VK2, VK4, and VK5. My last 2 contacts on 20m were also VKFF reference areas. Ian VK1DI in VKFF-859 gave me a call, and this was followed by Fred VK4FE portable in Mowbray National Park, VKFF-367. For more information on Ian VK1DI’s activation, check out his blog at….. 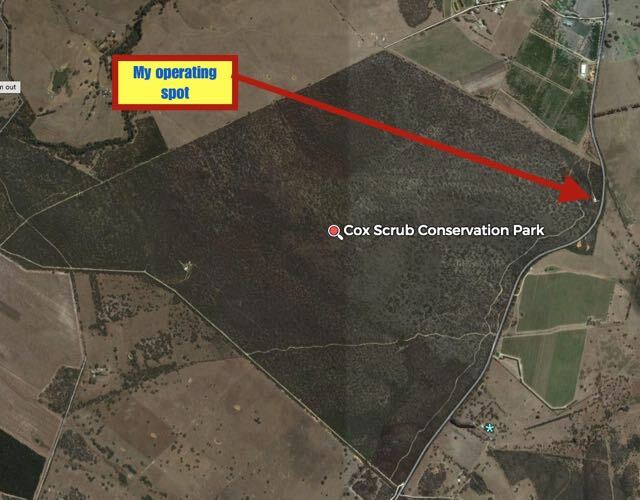 I went on to work a total of 17 stations on 20m, before I decided it was time to pack up and head off to Cox Scrub Conservation Park. It was 3.00 p.m. South Australian local time. This was another very successful activation, with a total of 71 contacts in the log. 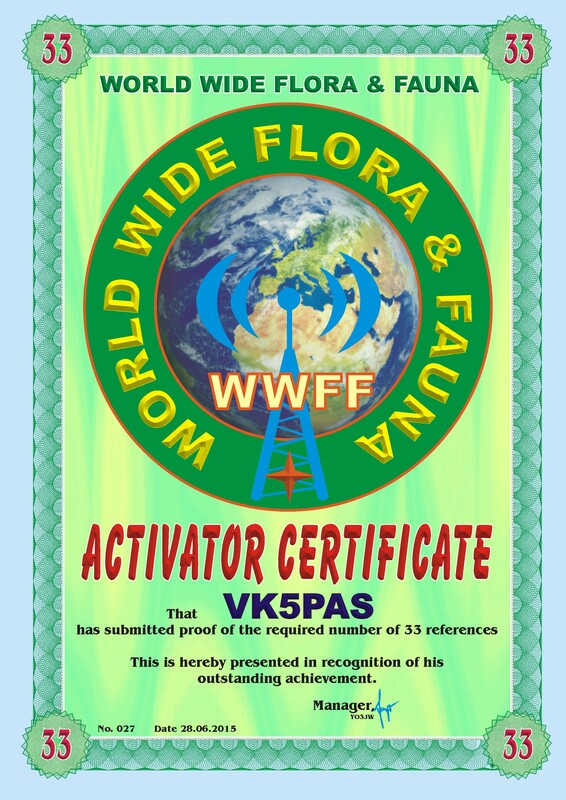 I also received an Activator certificate for the WWFF program. This one is for activating 33 different WWFF reference areas. 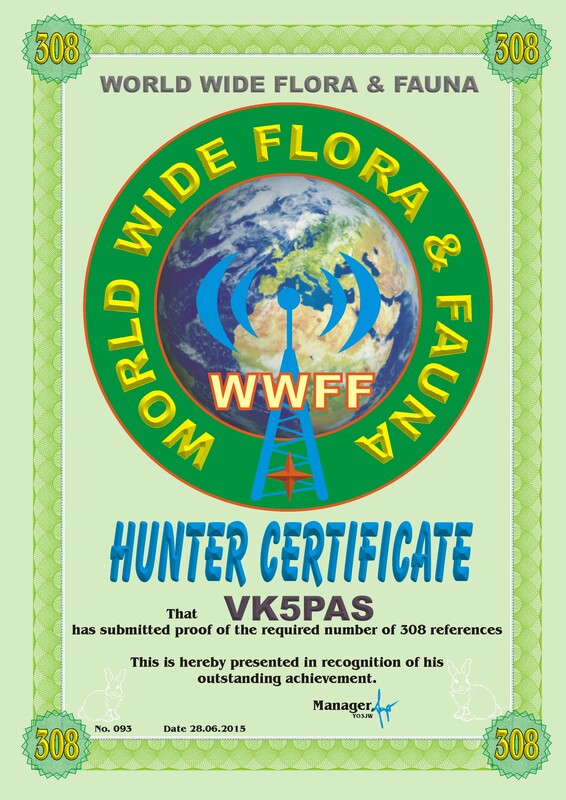 Many thanks to Pit YO3JW for sending me my latest Hunter certificate for the World Wide Flora Fauna (WWFF) program. This one is for working 308 different WWFF references around the world. It was our last day, Monday 22nd June 2015. It had been a terrific 11 days away. Lots of laughs (spurred on by red wine), great scenery, and some great park and SOTA activations in some quite remote parts of South Australia. Today we were heading home, but along the way we were to stop in to Argadells and travel along one of their 4WD tracks to activate the summit, Mount Arden VK5/ NE-034, as part of the Summits on the Air (SOTA) program. We had intended to activate Mount Arden earlier in our trip, but the bad weather had conspired against us. 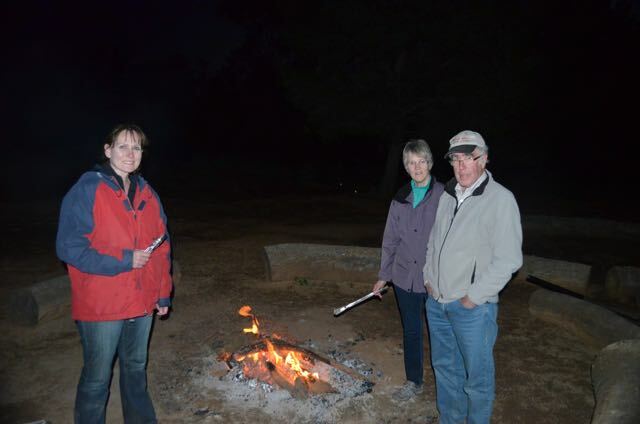 So we all travelled together, heading south on The Outback Highway. Along the way, there was plenty of native fauna to view, including kangaroos, emus, and a view photogenic Wedge Tailed Eagle who was sitting up on the top of some ruins between Hawker and Quorn. Marija and I also briefly stopped off again at the Kanyaka Ruins. Although we had stopped in there on the way up to Farina, the weather on that day was terrible, and our exploration of these amazing ruins was cut short. We then travelled back down the Arden Vale Road, and through the Willochra Creek, which still had a bit of water in it. Albeit, a lot less than the week prior. And as we travelled south on Arden Vale Road, we were able to get some great views of Mount Arden in the distance. The tower on the top of the summit was clearly visible. This was a very different view of the mountains compared to the wet weather days we had experienced at Argadells, when the summit and the surrounding terrain was fogged over. Once we arrived at Argadells we touched base with Judy, the owner, and then proceeded to the campgound where John unhitched his camper trailer, and we unloaded some gear from the back seat of his Nissan. The plan was for David & Joy to travel with John and Jenny to the top of Mount Arden. It wasn’t long before David and Joy arrived, and we were away to the top of Mount Arden, despite the very windy conditions. 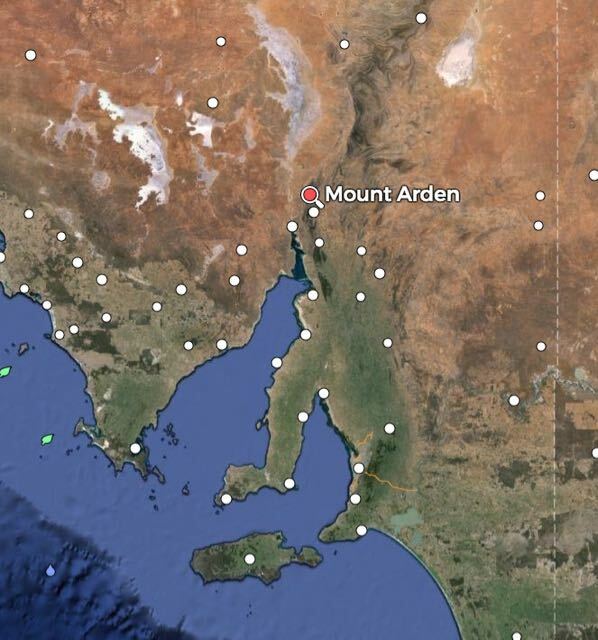 Mount Arden is located on the property of Argadells and is about 350 km north of Adelaide. The summit is 844 metres above sea level and is worth 6 SOTA points. This was to be a unique activation for myself, John, and David. The summit has been activated once before, by Ian VK5CZ in October 2014. The 4WD track to to the summit, which is rated as ‘challenging’, passes through some amazing scenery on the Argadells property. This includes creek crossings, and steep climbs, which requires low 2WD. The views on the way up are truly inspiring. I was amazed at how the terrain changed quite dramatically as we travelled to the top of the summit. The Hannimans Gorge is a pretty area with lots of water flowing through the creeks. The terrain here is very green and lush with some spectacular river red gums. Once up on the top of the summit, we soon gathered that it would be a challenge in erecting the squid poles. It was incredibly windy. John was very keen to try some 6 metre action, so he tried calling on 6m, but sadly had no luck. I set up a 40m station, and once I had qualified the summit, David VK5KC, and then John VK5BJE also qualified the SOTA peak. Despite the towers and radio communication equipment on top of the summit, is is a very RF quiet location. My first contact was with SOTA die-hard, Peter VK3PF with a good 5/8 signal (5/5 received), followed by Ian VK5IS at Beetaloo Valley (5/9 both ways), Rex VK3OF at Swan Hill (5/9 both ways), and then Ray VK3YAR at Mandurang near Bendigo (5/9 sent and 3/4 received). There was quite a significant difference in the reports from Rex and Ray despite there only being a 190 km difference. My fifth contact was a Summit to Summit contact with Gerard VK2IO who was on top of SOTA peak, Mount Meehan, VK2/ CT-042, north of Orange (5/7 both ways). I also tried 20m briefly but could only manage 5 contacts there. My first contact on 20m was with Ian VK5IS, followed by Phil VK2JDL, Peter VK6RZ (5/ sent and 3/2 received), Dave VK4DD, and finally Glenn VK6HAD (5/8 sent and 3/1 received). It seemed as if it was one way propogation from/to Western Australia. Band conditions on both 40m and 20m seemed to be very poor. Not to mention the weather conditions on the summit. Although it was quite a mild day, the wind was absolutely howling on the top of Mount Arden. My squid pole collapsed on at least 2 occasions due to the very high wind speed. I ended up with just 11 contacts for this activation. The bands were exceptionally quiet. Not surprising when you look at the solar conditions. The sun has been very unstable and there was a significant Coronal Mass Ejection (CME). It was a slow drive back down in low 2WD. We enjoyed some amazing views and encountered quite a few kangaroos and euros on our way back to the camp ground at Argadells, where we enjoyed some lunch. On Sunday morning, 21st June, 2015, we all awoke to a beautiful sunny, but crisp morning. And we were all hoping that we would get the okay from the owners of Merna Mora, for us to travel out along one of their 4WD tracks to the Lake Torrens National Park, VKFF-278. We had planned to activate Lake Torrens on Saturday, but there had been a lot of rain here in the north, so the 4WD tracks on Merna Mora property had been closed. So we patiently waited and were then given the thumbs up by Philip and Sonya, the owners of Merna Mora. To say I was excited was an understatement. The rain had affected our trip quite a lot, and I was very keen to do a bit of 4WDing out to Lake Torrens, and of course activate a unique park. 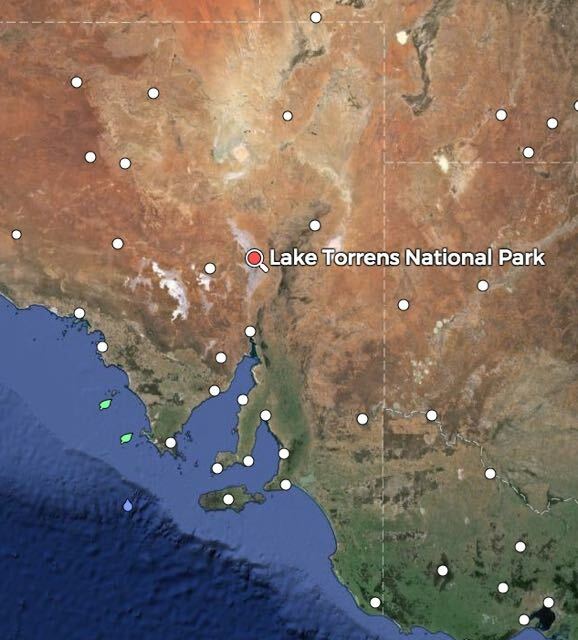 Lake Torrens National Park is a very remote park, situated about 350 km north of Adelaide. It consists of stark wilderness and the salt lake that stretches 250km in length. 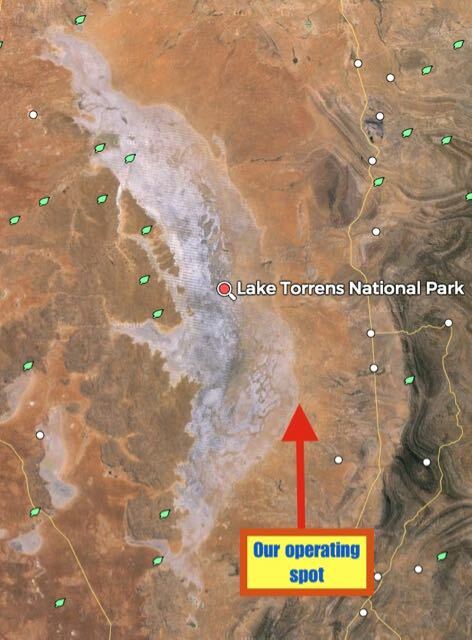 Lake Torrens is normally a dry salt flat and has only been filled with water once in the past 150 years. Thunderstorms occasionally provide a small amount of water in the lake and when this occurs, a variety of birdlife is attracted to the area. By 10.15 a.m. we were on the road. The 4WD track out to the lake is about a 110km round trip, taking you through some amazing country. We activated the park from very close to the shore of the lake itself, just off the 4WD track. After arriving at the lake, John VK5BJE and I were quick to set up our stations. John wanted to give 30m a crack again, so I started out on 40m, calling CQ on 7.095. Quite appropriately, after his earlier help, my first contact was with Mick VK3PMG. This was followed by Les VK5KLB, David VK5HYZ, and then Peter VK5FLEX. Band conditions on 40m appeared to be very good. It was very pleasing to have a steady flow of callers from VK2, VK3, VK5, and VK7, all with good signals. After working a total of 22 stations I took a break, as I was getting a bit of interference from John VK5BJE. We had set up a little bit too close to each other. I had some lunch and enjoyed the sunshine, and admired the amazing view of Lake Torrens. After lunch I put out a few calls on 15m, but sadly there were no takers. And because we had no mobile phone coverage in this remote part of South Australia, we were not able to spot ourselves on parksnpeaks. So I put a few CQ calls out on 14.310 and spoke with VK2ID portable on the beach, Alan VK4ALA, Fred VK4FE, Craig VK2PAW, and then Marc operating a military transceiver and running just 25 watts. I then called CQ on 40m and my first contact there was with Cliff VK2NP, followed by Gerard VK2IO who was operating from SOTA summit, Mount Canobolas, VK2/ CT-001, near Orange. This was followed by a call from Karl VK2GKA activating STA peak, Mount Alexandra VK2/ IL-005 near Mittagong. A few contacts later, Peter VK3YE gave me a shout, whilst operating portable from Chelsea Beach in Melbourne, with a home brew transceiver. 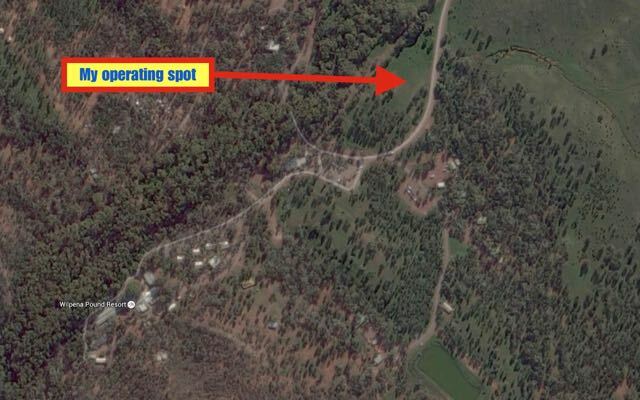 I also had a contact with Ian VK1DI who was activating O’Connor Ridge Nature Reserve VKFF-857. For more info on Ian’s activation, have a look at Ian’s blog at….. I managed to push on and go past the required 44 contacts for the World Wide Flora Fauna (WWFF) program. After 2 hours in the park I had a total of 47 contacts in the log. 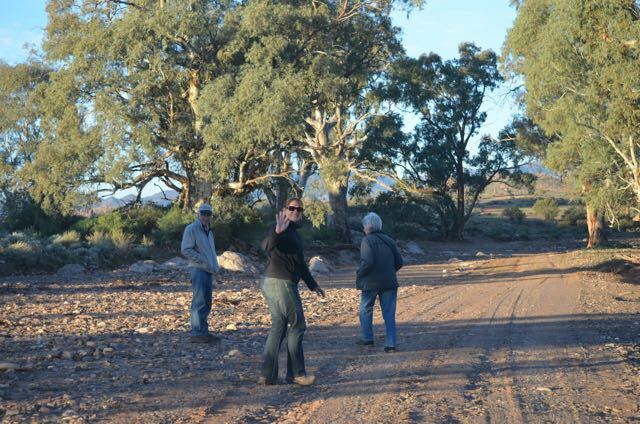 We headed back to Merna Mora along the 4WD track, admiring the views of the Flinders Ranges and viewed a large amount of wildlife, including Western Grey kangaroos, Red Kangaroos, Emus, and Wedge Tailed eagles. Also avoiding the occasional stock that we encountered along the way. 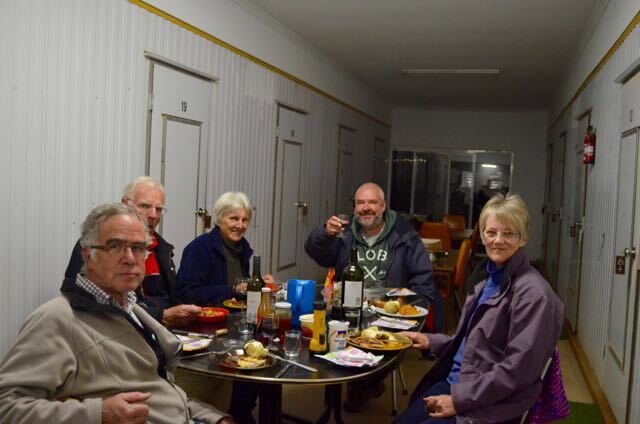 After returning to Merna Mora, we stoked up the outdoor fire and cooked some potatos in jackets in alfoil, as part of our tea, which we all enjoyed together again in the indoor kitchen area. After leaving the Aroona ruins, we headed a bit further east on the Brachina Gorge Road and stopped for lunch. Whilst there I spoke with Joe VK3YSP and Julie VK3YSP who were operating portable at the Melbourne Museum as part of Museums Weekend. Both Joe and Julie had a terrific 5/9 signal into my mobile station. After lunch we continued east on the Brachina Gorge Road through the park until we hit the bitumen of the Flinders Ranges Way. We travelled a bit further south and went to the top of the Stokes Hill lookout, which offers some amazing views of the Flinders Ranges. Sadly, the summit does not qualify for the Summits on the Air program. After leaving Stokes Hill lookout we continued south on the Flinders Ranges Way and then turned right into Wilpena Pound Road and on to the Wilpena Pound resort. It was here that we refueled and grabbed a cup of coffee. I headed over to a cleared area on the northern side of the main carpark and set up my station, the Yaesu FT-857d, and the 40m/20m linked dipole. John VK5BJE headed a bit further over to the south and operated from a spot where he had activated from previously. John was going to call on 40m and I decided to stick to 20m. I started calling CQ on 14.244, which is the nominated calling frequency for the WWFF program. My first taker there was Jim VK2QA, followed by David VK4HAX (I was David’s first ever 20m contact), and then Caleb ZL2ML. Unfortunately there was a lot of QRM from a nearby Italian station, so I QSY’d down to 14.200 and called CQ again. This time my CQ call was answered by Karl VK2GKA, followed by James VK1DR and Bruce VK4YS. My first DX contact was 6 calls later and it was no less than my very good friend, Marnix, OP7M in Belgium. Marnix was 5/7 and he gave me a 5/5. It was great to get Marnix in the log. I went on to work a further 12 stations in VK2, Italy, Poland, Germany, England, Canada, and Switzerland, until I was called away from the radio. It was one of the DEWNR ranges who was a little bit stand offish. Fortunately in over 200 activations, I have only had one previous ‘bad’ contact with a DEWNR ranger who told me off for tying off one of the ends of my dipole to a gum tree. And this fella, also did not have a lot of personal skills, I am sorry to say. I was advised to seek permission first in future as people would ask questions about what I was doing????? Secondly I should seek permission before driving the squid pole holder into the ground. I bit my tongue for a while and when I questioned him about this, and asked how was it any different to a tent peg or a totem tennis pole. I never got a sensible reply. Oh well, it was bound to happen again, a poor interaction with somebody from DEWNR. In any event, ‘permission’ was granted for me to continue, but by this time everyone had given up on waiting for me on 14.200. I worked Lee, AK4QA in Alabama in the USA, Albert S58AL in Slovenia and then Gyula in Hungary. My last contact for this activation was with Rob VK4FFAB who was portable in the Conondale National Park VKFF-109, which is located south west of Noosa Heads in Queensland. Rob had a nice 5/7 signal and he reciprocated with a 5/4 for me. It was time to pack up and head back home to Merna Mora. David and Joy had already headed off, which left just radio die hards John and myself, and our patient wives Marija and Jenny. We had a very enjoyable drive back to Merna Mora along the 30km long Moralana Track through Arkaba Station and Merna Mora Station. We enjoyed the most amazing sunset and as Marija said, the most number of kangaroos we had ever seen. And along Moralana Track I fired up the IC-7000 in the car and spoke with Rob VK4FFAB portable, Peter Vk2NEO, Jim VK5TR, Colin VK4FAAS, Perrin Vk3XPT, and Ivan VK5HS. After gettng back to Merna Mora, and freshening up a bit, we had a very enjoyable dinner together and the obligatory few bottles of red wine. That guy John VK5BJE is a very bad influence!